This article is an update to an earlier article – the fifth in a series on how to avoid the pitfalls of centralised procurement. In the first article I commented on the reasons why, when many large organisations embark on centralised procurement initiatives with the promise of substantial savings, direct increases in profitability fail to materialize within the business units. A discussion to capture the views of other procurement professionals has been running at Procurement Professionals Group on LinkedIn. This week I re-analyze the comments – 311 at time of writing this article – from 118 contributors, excluding myself. As a piece of qualitative research, the discussion was not intended or designed for quantitative analysis. I have attempted, nevertheless, to identify, normalize and count the reasons for failure mentioned by the 118 contributors. Whilst I accept that the validity of this analysis is questionable, I do feel the results give some valuable insight to the causes of failure, and possible areas to be given attention in order to deliver a successful centrally-led procurement programme. First I shall comment briefly on the method of analysis. The initial comment from each contributor was examined and the key reasons identified. Typically contributors gave between one and four reasons. A few contributors gave no reasons in their first comment (for example one contributor’s first comment was a question) but did so in their second comment. In such cases the reasons in their second comment were identified. Collectively, I have called these ‘original mentions’. Some contributors posted several comments, restating and clarifying their views. I chose not to count the subsequent mentions of their original reasons. Also, in their later postings, some contributors were debating others’ reasons and, again, I chose not to count these mentions. 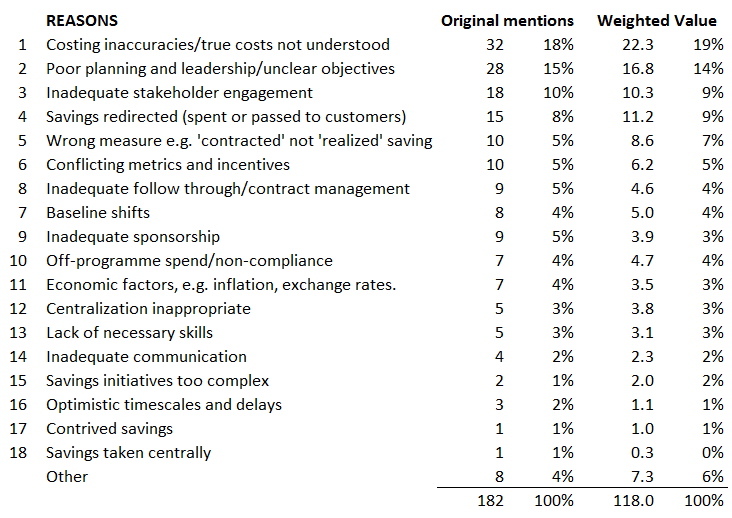 The reasons were listed and normalized to produce the 18 Reasons listed in Table 1. A few reasons we unclear or ambiguous, so they were categorized as “Other”. Two counts are listed against each of the 18 Reasons. The counts are also expressed as a percentage of their respective totals. The first is the total count of ‘original mentions’. The second is a weighted value calculated by attributing to each contributor a total value of 1 shared equally across his/her reasons. For example, if a contributor provided 4 reasons each was given a value of 0.25. The first count gives equal weight to each mention, and the second count equal weight to each contributor. There are a total of 182 mentions from the 118 contributors. The most frequent reason given for failure of cost savings initiatives to deliver to the bottom line, was Procurement’s lack of understanding of the true costs and resultant savings. In second place was poor planning and leadership/unclear objectives which covered a range of procurement management-related reasons, including misdirection and inappropriate pursuit of cost reduction where other objectives (e.g. quality or efficiency) were deemed more important. Inadequate stakeholder engagement was the third reason. Arguably, lack of stakeholder engagement is a cause of other failures, notably lack of understanding of the true costs, unplanned redirection of savings, delays and non-compliance. Contrary to the results, it is my belief that inadequate stakeholder engagement is the number one reason for failure and that these other causes are symptomatic. The discussion thread gave some support to this hypothesis but the construct of the research provides no means of testing it objectively. Readers may be interested in the article “7 Essential Elements of Stakeholder Engagement” in which I give a pragmatic guide to ensuring stakeholder engagement in projects and programmes. Savings redirected refers to redirection within Business Units or by budget holders, for example where budgets are not adjusted downwards to reflect the procurement savings, or where savings are passed on to customers. Comments relating to savings taken centrally and not passed to BUs or budget holders, for example central rebates, were counted separately. Conflicting metrics and conflicting incentives, and a lack of joined-up KPIs across departments and functions, can encourage non-compliance especially if communications and stakeholder engagement are poor. Inadequate follow through/contract management refers to the disengagement and dissociation of Procurement after setting up the contract. This behaviour might be reinforced by performance measures based on theoretical ‘contracted savings’ rather than ‘realized savings’, with non-compliance being a major reason for the difference between the two. Baseline shifts may occur due to changes in purchase requirement for example through product developments or innovations. Inadequate sponsorship refers to sponsorship by C-level executives, as distinct from procurement leadership covered in an earlier Reason. Economic factors, e.g. inflation, exchange rates were given as a reason but, arguably, these should be forecast and any losses offset by comparable gains. Failure to forecast was included here rather than in costing inaccuracies. Lack of necessary skills refers to the capability of procurement management and staff. We might expect this reason to be understated given that the contributors were mainly from the procurement function. Procurement initiatives that are too complex for stakeholders to execute were identified separately but may be linked to both poor planning and lack of skills. Optimistic timescales and delays in achieving savings (doing the right things more slowly than planned) were identified separately from other planning and control issues (doing the wrong things) covered in an earlier Reason. There was a specific reference to contrived savings, or fabrication of results, which was worthy of mention separately from costing inaccuracies. Finally, the practice of taking savings centrally to withhold them from BUs and budget holders was discussed, and views expressed regarding the adverse effect this may have on relationships with some stakeholders. I hope that any readers involved in a centrally-led procurement programme will find this analysis helpful as an aid memoire when considering the risks to successful delivery to the bottom line. Individual comments and the opportunity for readers to post their own comments are available in the discussion “Why do so many procurement cost saving initiatives fail to deliver to the bottom line?“ in the Procurement Professionals (Open) Group on LinkedIn. This entry was posted in Avoiding the Pitfalls of Centralised Procurement, Procurement, Supply Chain by Tony Colwell. Bookmark the permalink.